After granting a controversial €4.5 million raise to pilots, Air Malta registered its first profit since 2008. CEO Peter Davies tells Christian Peregin the restructuring programme is ‘bang on target’. Air Malta has just recorded an operational profit for the first half of this year. Why is this news? It is a fantastic achievement by a lot of people working for this company. They have been working very hard and diligently to try to secure a profitable airline. I think the news we have in terms of profitability is a huge boost obviously for employees but I think an equal boost for the people of the country. How was the profit achieved? It was achieved by improved revenues which we increased where possible, but also substantially reduced costs. We’re reducing our headcount by 450 people but we’ve also saved considerably on fuel as a result of more effective fuel hedging, more effective flying and just trying to save fuel where we can. We have a huge amount of work to do but I think this is quite significant in as much as this is the first time in four or five years that this company has made a modest profit, which shows we’re on the right track. Is Air Malta out of the woods? Is this the first sign that the restructuring plan is going to work? No, we’re not out of the woods. At the moment we’re chopping quite a few trees down and trying to see our way through the woods. I think the important thing is that we have a path and we’re very focused on what we want to achieve, but no, we have a long way to go. However, when we have a hard task ahead of us, sometimes it is important to indicate how we’re doing against that task. And I think this is of substantial encouragement to the people of this country. Why is it so hard for an airline to turn a profit when it deals with a growing tourism industry like Malta’s, which seems to be hitting records practically every month? It is difficult in as much as we’re trying to overcome many years of processes and procedures which are quite frankly not in line with the modern market. So we had to do these rapid and quite significant changes in terms of how we operate as an airline. You can’t do that in five minutes. It takes a length of time. Do you expect to turn another profit in the second half of the year or is this a one-time lucky strike? One swallow doesn’t make a summer. We have just come through a substantial improvement in tourism numbers and we’ve taken every advantage of that. So obviously during the summer period, we’re going to make profits... I think it’s important to point out that in the second half of the year, the next two quarters, we will make a loss. The overall requirement of the restructuring plan for this year is to show a loss of €15 million. Last year we lost nearly €31 million, so weare substantially reducing our losses. So you are on target, but not particularly ahead of target. We’re just slightly ahead of target but I’m certainly not complacent as a result of that and one continues to be cautiously optimistic... If you take the combination of the two halves of the year compared with previous years and then compared with the restructuring plan, we’re bang on target for what we said we would achieve by way of restructuring and we’re streets ahead in terms of reducing our losses compared to previous years. 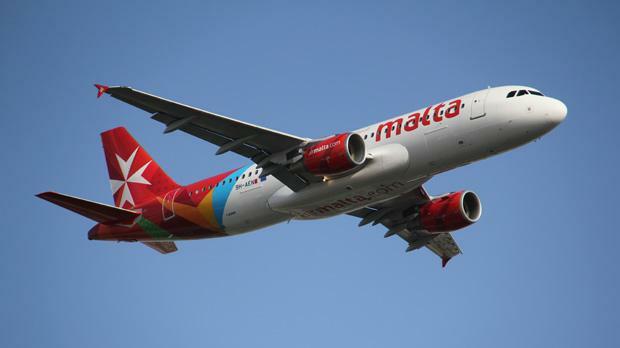 Air Malta just sold off its subsidiary company Holiday Malta. How much revenue did that generate? I’m not in a position to specifically talk about revenues. That is confidential information. Is that what helped turn a profit in this year, though? No. I mean, it’s just a whole series of things. Profits are driven principally as a result of improved revenues and reduced costs. But is the sale of Holiday Malta, like the eventual sale of Flyaway Tours, part of the increased revenue? It’s not regarded as revenue in the classic sense. Our revenue comes from moving passengers and cargo. The sale of our subsidiary companies is designed to improve our cash position and to make sure we improve our balance sheet. Does the increased revenue therefore mean you are squeezing more money out of customers in a sense? Our intention is not to squeeze customers at all. Are you making more money per customer than you used to? We’ve changed our pricing structures and the idea is we want to provide more pricing opportunities for people to buy our fare. So the perception is our fares are becoming slightly lower and that is our intention. Isn’t one of Air Malta’s major problems the fact that it has overspent when it comes to obtaining services and contracts? It certainly has many antiquated processes and procedures which we need to change. We have a number of contracts which we’re re-negotiating. So in light of this, how do you justify spending €2 million on a rebranding exercise, more on marketing and €4.5 million on a raise for pilots? The figure you mentioned for pilots is the gross amount. Obviously in terms of negotiations with Alpa (Airline Pilots Association) we got many advantages in terms of improvements and how much it costs us to fly the aeroplane for A to B, so the net cost is substantially less than that. As far as we’re concerned, about €1 million... We expect to recoup around two- thirds or three-quarters of the cost by way of improved productivity and other factors which we negotiated with Alpa, who understandably were willing to try and support the company in terms of making sure we’re able to reduce those costs or at least get value for money in terms of being more efficient. Regarding branding, it’s a philosophy... We’re trying to create a sense of purpose for this airline. We represent the values of Malta. We are selling Malta as a destination, so it’s the first and foremost thing we have to do: selling Air Malta comes secondary to that. If we want to demonstrate the exciting cultural depth and fantastic heritage of this country and its lovely people... why shouldn’t we have a resplendent brand livery and all the things that go along with that to try convince people that this country is worth looking at? Ultimately, you are still spending millions. Are you saying you are spending it in a smarter way than before? A lot smarter... It’s a question of hard work, understanding where we are overspending and where we can save costs through efficiency... It is not rocket science. It is exceptionally hard work. But that is what we are here for. Going back to the new collective agreement with pilots, was this a pre-election payout? Some have made a connection between the airline’s generosity and the fact an election is around the corner. I can categorically state this was no buyout whatsoever. I’m under no political influence. This was a straightforward normal business negotiation between an airline and its union, like the others. So did you ever tell Finance Minister Tonio Fenech what you were planning to offer at any stage? Did he just wake up the next morning and you told him you reached a deal? But he’s your boss in some way. Yes, but we have a restructuring plan that’s four years in process. It has been signed off by the board and then by the shareholders and ultimately by the European Commission. So everyone knows what we have to achieve. My job as the chief executive is to make sure we come in on those numbers. However I do that, provided it is honest, decent and legal. And of course that’s what we’re sticking to. So I make the judgement and that is what I get paid to do. Would you describe the pilot’s raise as generous? How do the new salaries compare to those of other airlines in the EU? Do you think pilots of Air Malta are being paid competitive rates? They’re getting the rate a pilot would earn in Malta. Obviously there are pilots who fly for Qatar and Emirates who get a higher rate. Pilots earn good money around the world. That’s a fact of life. Everyone needs to grow up and understand that. That’s what pilots earn. Why was the pilots’ agreement kept secret? The signing of such collective agreements usually takes place in front of the cameras. The Times only released the information thanks to a leak. Why all the secrecy? Doesn’t it make people suspicious? If they choose to think with suspicion, that’s how they’ll think. But I can assure you and look you in the eye there were no suspicious circumstances. I’ll tell you what happened. We signed this deal two rooms away at 1.30am and that had to be ratified both by my board and Alpa members. It would have been unfair for us to say something before Alpa had a chance to speak to them. There was no proper announcement that the contract was even signed later. That’s an indication of how I’m running the company differently, then. I do things differently. Why, though? What was the logic behind it? The logic is that this is a run-of-the-mill everyday business... We’ve signed a deal with the pilots, let’s move on. Alpa president Domenic Azzopardi is under investigation for causing a delay on a flight when he was on a private holiday. Is he still under investigation? The investigation continues and that’s all I’m prepared to say about it. It certainly hasn’t been dropped. Why is it taking so long to conclude? It happened a while ago and it’s not like you’re investigating a complex case of fraud. It’s just a process that we’re going through. There are other priorities. That too is a priority. We’ll get to the bottom of that and Domenic will have his opportunity to explain the circumstances, as indeed would other people, about why that particular aircraft is delayed. It is technically sub judice. We’ve asked Alpa to appoint someone independent and we’ve appointed someone independent ourselves. Both will look at the facts as is correct and it’s just taking time to organise that. Did you postpone the outcome of the investigation because of the collective agreement signing? Absolutely not. I think people are getting to know I don’t shirk my responsibilities. If I felt that it was appropriate to make a decision at the time I would have done so. It has nothing to do with the collective agreement. Sections of the press recently reported that too much time had passed for action to be taken. Is that the case? It’s not, because we were in correspondence with Alpa during those negotiations to make sure there is no discrepancy when it came to the fact that we may have been out of time. That’s been agreed. The restructuring plan mentioned a paid catering service. Is Air Malta going to start charging for food? We have to recognise there is a different way in which we can attract customers. It is not just a question of food. We want to be ambitious in terms of our on-board product. Now, if by selling some of those elements on board the aircraft, which is very common on most airlines now, then why wouldn’t we take advantage of the 21st century? We need to make sure the overall value of the price someone would pay to travel Air Malta, including to buy some food or goodies or duty free or whatever, is perceived to be good value to them. But is Air Malta going to start charging for food for its in-flight meals? So a decision has not yet been taken? No it hasn’t been taken. Charging for food on board is usually linked to low-cost airlines. True. But you’ve asked me before: what sort of airline is this? And it’s up to you guys to decide. Hybrid, legacy, network, low-cost... It’s irrelevant to me. We’re an airline. We fly safely from A to B. Principally into Malta, carrying passengers and tourists who want to come here. And we need to maximise the revenue opportunities of those people when we carry them. Don’t you have quite a long-standing agreement with the food company Sky Gourmet? To start charging, wouldn’t you need to renegotiate that? Yes and we’re having conversations with Sky Gourmet at the moment to realise what opportunities we have as a company and them as a supplier in terms of changing the way in which we have our products on board the aircraft. There are ongoing conversations as we speak. And what is your end point at this stage? Whenever I speak to Air Malta employees I get the impression that even though you are achieving the targets, the management are still unpopular. I don’t get that feedback. We had an event with the staff last year in June and one of the first things I said was that I have to earn your respect, not demand it. And I think with some of the things we’ve done, people are certainly beginning to understand that my colleagues and I understand this business, which we do, and we can talk the language of professional airline management. We’ve done certain things we said we would stick to and I think there’s an acknowledgment from our workforce that while they thought we wouldn’t last or that things would never change, we have. And I think there is an element of... I wouldn’t say admiration... but an understanding that we are professional people.